Language Systems Lifestyle! : How to play pool with DJ! 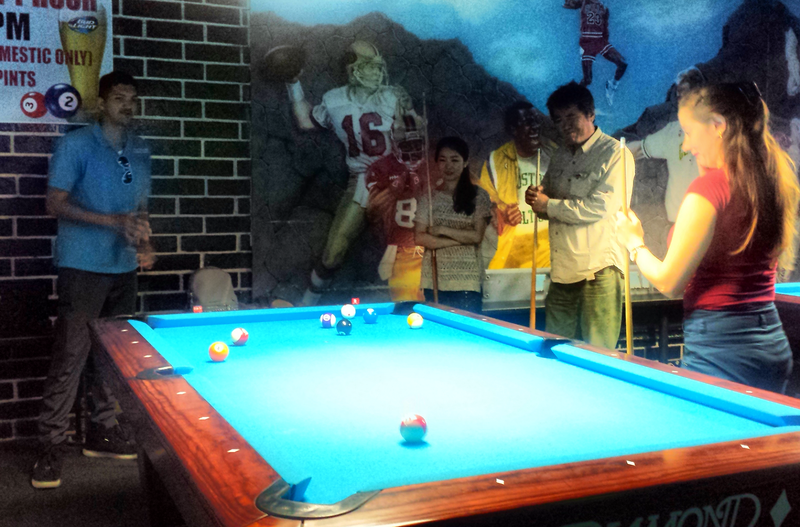 On Saturday the students and I met to play and learn to play pool. I was surprised to see that our new Chinese student, Lisa, was actually a pretty good player and very competitive, like a mini version of me! The other students took instruction very well and after playing against each other on teams (South/North America vs Asia, Girls vs Boys, Older vs Young) for a couple of hours we decided it was time to eat! After a little restaurant debate, we finally decided walk on over to Hamburger Habit and wow was it ever so delicious! I think we all developed a habit after this and look forward to enjoying each others company again soon!